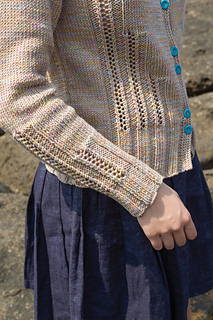 A classic cardigan with lace panels of varying heights, knit in pieces and seamed. 20 sts and 29 rows = 4” in St st using larger needles; 21½ sts and 29 rows = 4” in Lace Pattern using larger needles. Take time to save time, check your gauge.